Last time in this series, we began discussing how style and efficiency are paramount in any small kitchen design. Now that you have considered how to make your new kitchen efficient, you’re ready to work on the style aspects as you select materials and appliances. You want to make sure that color schemes, materials, and other design elements like mouldings and even the type of appliances fit in with the atmosphere of your home. Kitchen Views designers are very experienced and knowledgeable in this aspect of kitchen design. Our designers have worked wonders with many small kitchens over the years. In determining what style will be best for your kitchen, consider the style of the entire home. Too many kitchen remodels from several decades ago did not take this into consideration, and this is why so many people look to remodel today. Even if you plan to be in this home for many years, considering cohesive style from a re-sale perspective can be helpful. In the extreme, an ultra-modern kitchen will feel out of place in an antique Victorian house. So let’s stay away from such extreme differences of style. That said it’s absolutely possible to have all the modern conveniences integrated without compromising style. Whether your home is traditional or contemporary, one way to conceal appliances such as refrigerators and dishwashers is to use cabinetry panels. An experienced designer knows all the options available and will see that you find the right elements to meet your practical and aesthetic needs. Here is a beautiful example of a condo in Boston where the home had been brought up to date in every room but the kitchen. When it was time to remodel the kitchen, a skilled kitchen designer re-imagined the space, bringing in the style of the homeowners and transformed their home. 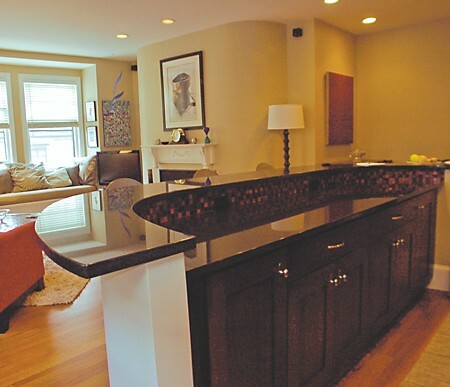 With a wall opened into the living area, the newly formed island serves as a casual eating area on one side and kitchen work area on the other. Notice that the refrigerator is hidden behind cabinetry panels, all the more important since this is seen from the stylish living room. The mosaic backsplash makes a strong artistic statement, conveying the homeowners’ style with a functional element of the kitchen. Here is a view from the kitchen into the living area showing how the shared style of the two spaces now work together beautifully. On the Kitchen Views website, you can see a video of the homeowner discussing the transformation. One of the major trends in kitchen design is incorporating green materials. As the kitchen is used every day, the materials need to stand the test of time. An experienced designer will show you choices in materials that are not only environmentally-friendly, but durable. The green cabinetry and countertop lines carried by Kitchen Views are proven to be durable and the cabinetry is manufactured in ways that are good for the planet. Omega and Irpinia are excellent examples of cabinetry brands that have an amazing selection of styles, colors, and materials all durable and good for the environment. When it comes to countertops, there are plenty of durable options that will beautifully enhance the room’s style. Granite is often everyone’s dream choice, like the Polished Absolute Black Granite used in the kitchen shown above. But there are many brands made with recycled materials that require far less maintenance. Quartz countertops like Cambria actually have patterns that look nearly like granite, except without the sealing and maintenance necessary for granite. Bearing all this in mind, look around your home and try to incorporate as many design elements as possible from other parts of your home into your kitchen. Remember, you don’t have to sacrifice style for efficiency, no matter what style you prefer. Just find the right designer to help you make your dreams a reality. Since the kitchen is such an important part of the daily activities in your home, it’s important that its style be an extension of your own personal style. When your surroundings bring you happiness, and the space is well organized, your daily chores won’t seem like work. Be sure to check back often as we continue our “Small Kitchen Designs That Work” series. As always, if you have any good ideas or design solutions that you know work, feel free to leave a comment and share them with us. Ah, even in these modern times I still have a soft spot for traditional kitchens.